It makes sense that in America’s Melting Pot, our history and traditions would be borrowed, almost exclusively, from the nations in which our ancestors originated. 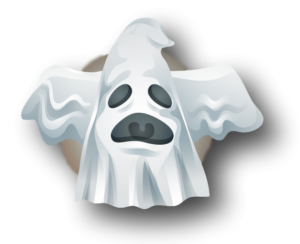 Original Customs of Halloween came from Europe. 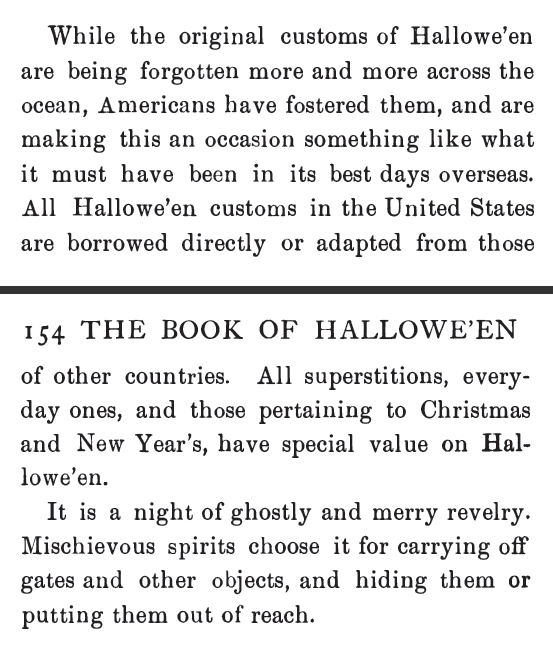 From The Book of Halloween by Ruth Edna Kelley, A.M., published August 1919. 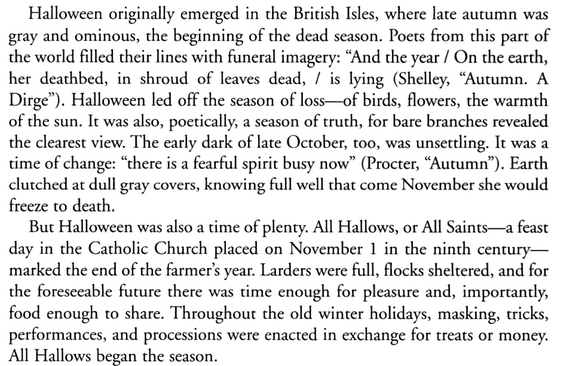 From A Halloween Reader by Lesley Pratt Bannatyne, an Anthology of Halloween Literature from the 16th through 20th centuries. The pagan Hallowe’en at the end of summer was a time of grief for the decline of the sun’s glory, as well as a harvest festival of thanksgiving to him for having ripened the grain and fruit, as we formerly had husking-bees when the ears had been garnered, and now keep our own Thanksgiving by eating of our winter store in praise of God who gives us our increase. Pomona, the Roman goddess of fruit, lends us the harvest elements of Hallowe’en; the Celtic day of “summer’s end” was a time when spirits, mostly evil, were abroad; the gods whom Christ dethroned joined the illomened throng; the Church festivals of All Saints’ and All Souls’ coming at the same time of year–the first of November–contributed to the idea of the return of the dead; and the Teutonic May Eve assemblage of witches brought its hags and their attendant beasts to help celebrate the night of October 31st. 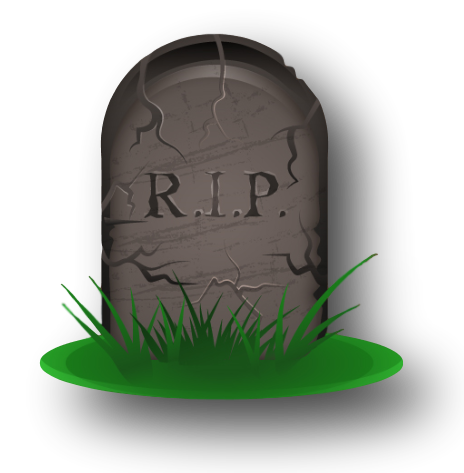 Why play superstitious parlor games on All Hallow’s Eve? Prelude to the Century continues, expounding on the “mild parlor variety superstition” mentioned above. 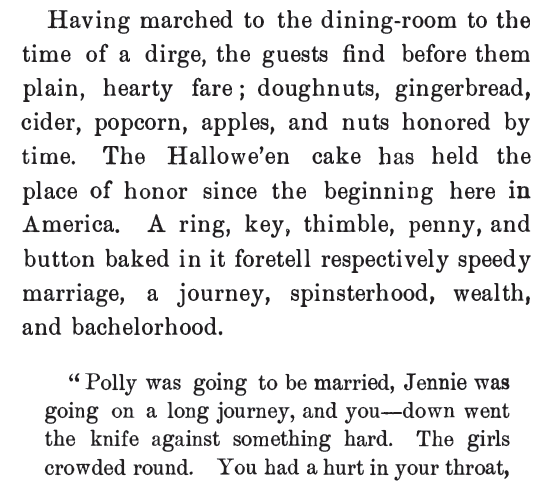 The book quotes The Ladies World, November 1892. A quaint method of determining the faithfulness of lovers is to put three nuts upon the bars of stove grates, naming the nuts after the lovers. If a nut cracks or jumps the lover will prove unfaithful; if it begins to blaze and burn, he has a regard for the person making the trial. If the nuts named after the girl and her lover burn together, they will be married. The reading of the nuts may prove for many a lad and lassie a true prophecy. Here is another device: Take three dishes, put clean water in one, foul water in another, leave the third empty. Blindfold a person and lead him to where the dishes are ranged; he or she dips the left hand–if by chance in the clean water the future husband or wife will come to the bar of matrimony a bachelor or maid–if in the foul, a widower or widow; if in the empty dish it foretells no marriage at all. It is repeated three times and each time the arrangement of the dishes is altered. The old test of putting apple seeds on the eyes or cheeks and naming them after swains is another practice. The most faithful is he who sticks the longest. But it is the maid with the stoutest heart who fears not her fate–and whose desires are great–who dares put it to the touch of the cellar stairs’ visit at midnight. The proper form is for her to let down her back hair, then “dressed all in white” with uplifted candle, á la Lady Macbeth, in the left hand a mirror, she proceeds to wend her way slowly–and alone–down the stairs backward to the cellar; it is then when the final step is reached and the critical and dramatic moment arrives, that she will see the pictured face of her future husband in the mirror she carries in her left hand. It is only for those possessing great faith that the face in the mirror will materialize. If the maiden reading this doesn’t believe in the efficacy of this special rite, let her try it for herself–seeing is believing. The 1912 title Games for Hallowe’en by Mary E. Blain ($0.00 on Amazon for kindle edition) was published just over a decade post Queen Victoria’s death. The impressions of the holiday voiced in this short volume will certainly reflect the author’s Victorian-era life. Note: This book outlines many different mild (superstitious) parlor games, explaining needed items to gather and how the games are played. These games are very much in keeping with the one described, above, from The Ladies World. 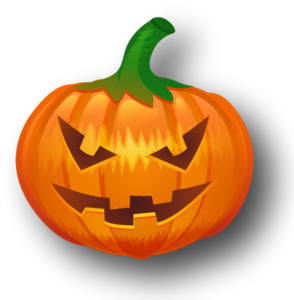 Hallowe’en or Hallow-Even is the last night of October, being the eve or vigil of All-Hallow’s or All Saint’s Day, and no holiday in all the year is so informal or so marked by fun both for grown-ups as well as children as this one. On this night there should be nothing but laughter, fun and mystery. It is the night when Fairies dance, Ghosts, Witches, Devisl and mischief-making Elves wander around. 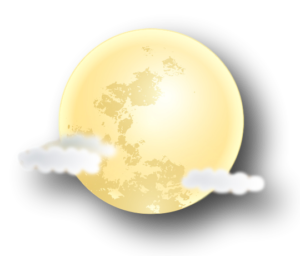 It is the night when all sorts of charms and spells are invoked for prying into the future by all young folks and sometimes by folks who are not young. In getting up a Hall0we’en Party everything should be made as secret as possible, and each guest bound to secrecy concerning the invitations. Any of the following forms of invitations might be used. Witches and Choice Spirits of Darkness will hold High Carnival at my house, …… Wednesday, October 31st, at eight o’clock. Come prepared to test your fate. 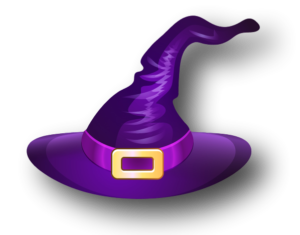 Costume, Witches, Ghosts, etc. 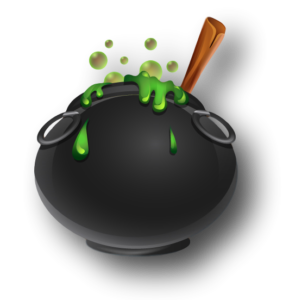 Miss Ethel Jones will expect to see you at her Hallow-e’en Party Wednesday, Oct. 31st, at 8 o’clock. She begs that you will come to participate in the mysteries and rites of All Hallow’s Eve, and to wear a costume appropriate to the occasion. On Wednesday, Oct. 31st, at 8 o’clock, I shall celebrate Hallow-e’en and hope that you will come and participate in the mysteries and rites of All Hallow’s Eve, so come prepared to learn your fate. 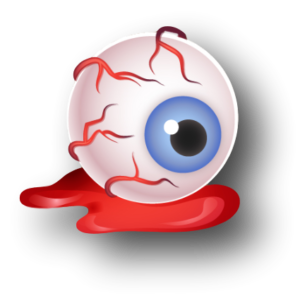 The room or rooms in which most of the games are to be played should be decorated as grotesquely as possible with Jack-o’-lanterns made from apples, cucumbers, squash, pumpkins, etc., with incisions made for eyes, nose and mouth and a lighted candle placed within. 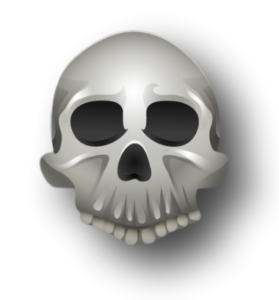 ….A skull and cross bones placed over the door entering the house would be very appropriate. 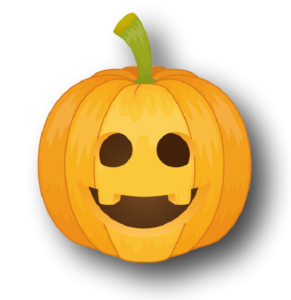 The hall should be in total darkness except for the light coming from the Jack-o-lanterns of all shapes and sizes in various places. The Record-Union of Sacramento, California on October 27, 1880. 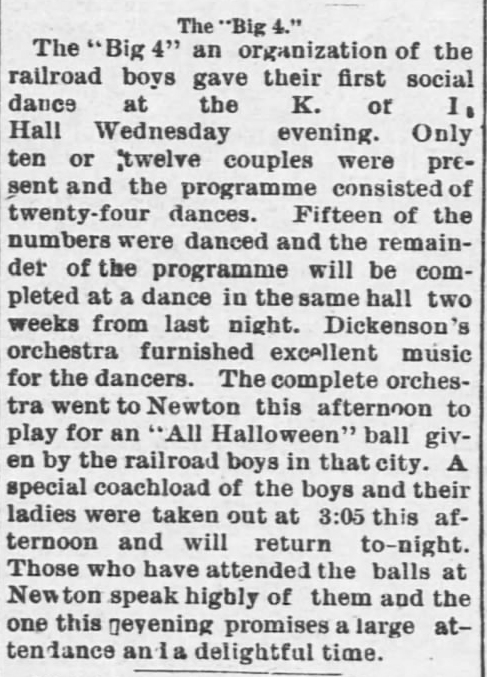 The Emporia Weekly of Emporia, Kansas, on November 7, 1889. The Salt Lake Herald of Salt Lake City, Utah on October 29, 1890. 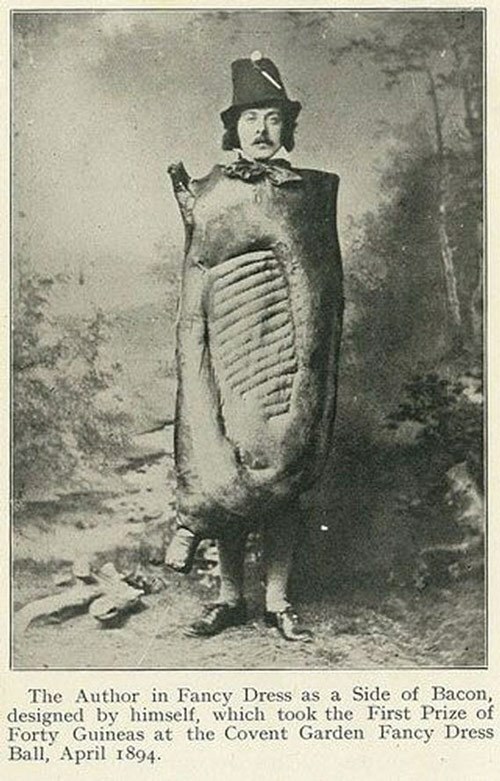 Traditional Halloween foods, Part 1, from The Book of Halloween by Ruth Edna Kelley, A.M. 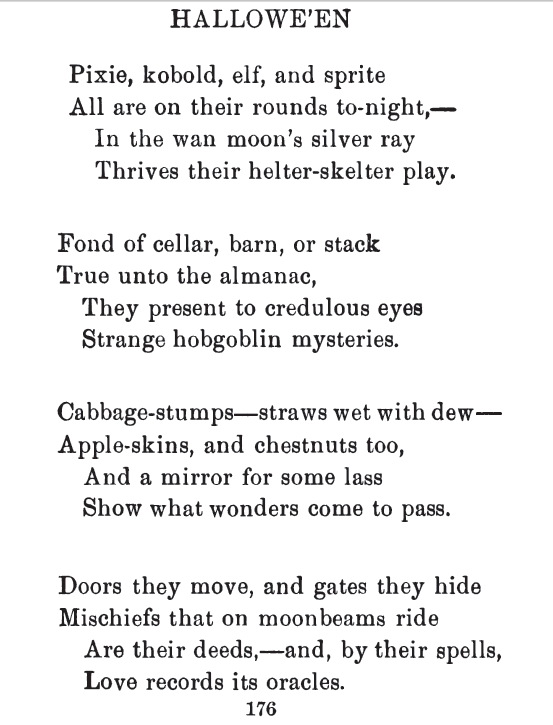 Traditional Halloween foods, Part 2, from The Book of Halloween by Ruth Edna Kelley, A.M.
Poetry was a frequent publication in magazines, newspapers, books, and used in abundance at gatherings and parties. 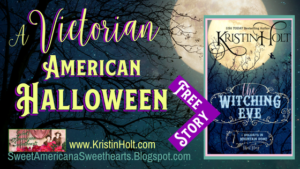 Poetry surrounding Victorian-era Halloween spoke of all of these elements in an entertaining fashion. The following example was by Joel Benton and published in Harper’s Weekly on October 31, 1896. 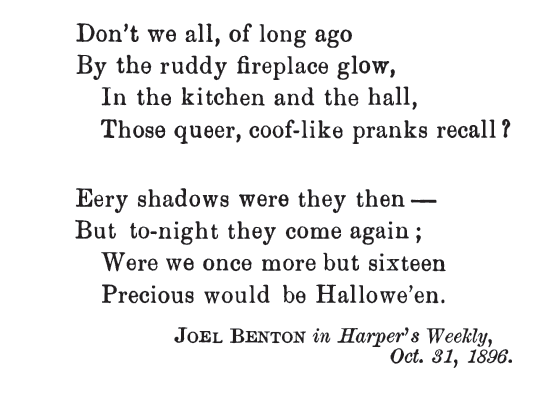 Halloween Poetry (part 1), published October 31, 1896 in Harper’s Weekly, and republished in The Book of Halloween by Ruth Edna Kelley, A.M.
Halloween Poetry (part 2), published October 31, 1896 in Harper’s Weekly, and republished in The Book of Halloween by Ruth Edna Kelley, A.M.
A couple weeks ago, I contributed a blog post to Romancing The Genres Blogspot. 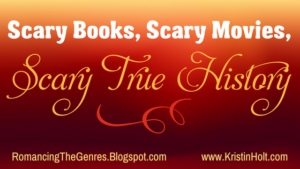 This brief post contains my best supposition about WHY people read (or in Victorian times, listened to) scary stories. Check it out! Ghost stories had a big place in the hearts of Victorians throughout the year, but particularly at Christmastime (sounds odd by today’s standards, doesn’t it?). 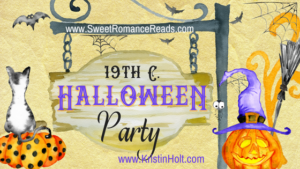 Spooky stories, usually about the frolicking of trouble-causing fairies, ghouls, and meddling spirits were a part of entertainment at Halloween. Parties often included readings of such stories. Courting couples would read aloud to one another in the family parlor from a recent magazine publication. 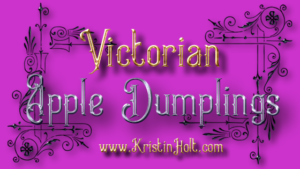 Plays on the stage (Victorians did love their live entertainment) often took on the cast of dark and spooky. 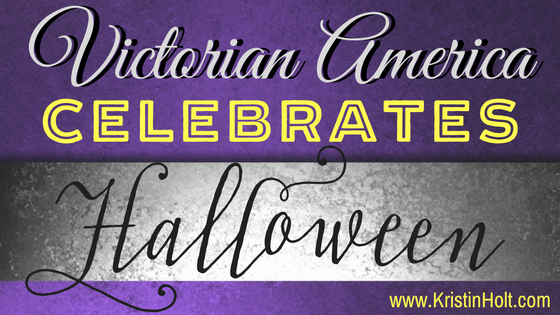 Victorian America and Easter Eggs Victorian Americans and Mardi Gras Victorian Americans Observed Groundhog Day? Victorian Letters to Santa Victorian Americans Celebrate Oktoberfest Victorian America Celebrates Labor Day Pioneer Day: Utah’s Victorian History Victorian America Celebrates Independence Day Victorian America Observes Flag Day Victorian America Observes Memorial Day Victorian America Observes Mother’s Day–on Sweet Americana Sweethearts Victorian America Celebrates Arbor Day Victorian America Celebrates Easter Victorian America & April Fool’s Day–on Sweet Americana Sweethearts Victorian America Celebrates St. Patrick’s Day Victorian Leap Year Traditions, Part 1 Victorian Leap-Year Traditions, Part 2 Leap Into Love– The Victorian Way: Sweet Americana Sweethearts Victorian Era Valentine’s Day Victorian New Year Celebrations, on Sweet Americana Sweethearts A Victorian Menu for New Year’s Day, 1892 American Victorian Era Christmas Celebrations Victorian Era Thanksgiving Celebrations Happy Birthday, United States! 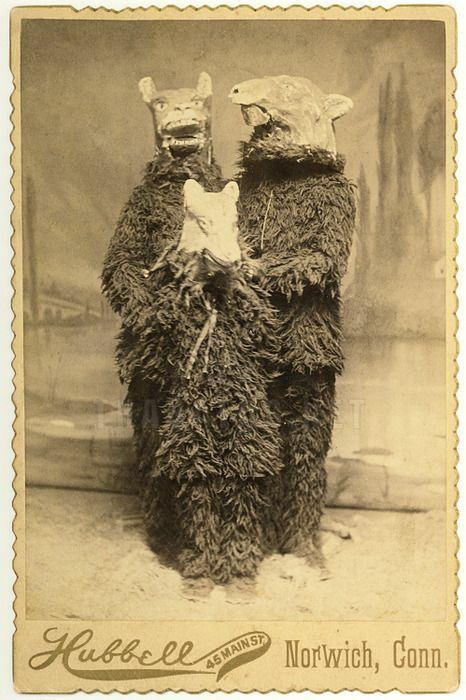 Aren’t those Victorian-era costumes really something? Glad you enjoyed, Diane. Thanks for stopping by.